Every time I cross to the U.S. by car, I always have my shopping list ready. I like to check out the outlet stores, but what’s even more exciting for me is going grocery shopping! Many Canadians like going shopping in the States because they have a better selection of everything, it seems, and much, much better prices. (Unfortunately though, for those of us looking for deals, our dollar has weakened quite a bit recently against the US$, so cross-border shopping is less attractive these days. But even so, I’m sure there are still bargains to be found). I find dairy products, in particular, much cheaper in the States. So I always like to buy a lot of cheeses. I mean, when prices are 30% – 50% less, I don’t think too much about what I buy! I also like to buy cream cheese. It’s always handy to have a few bricks of cream cheese lying around, since they can keep for a few months unopened in your fridge. 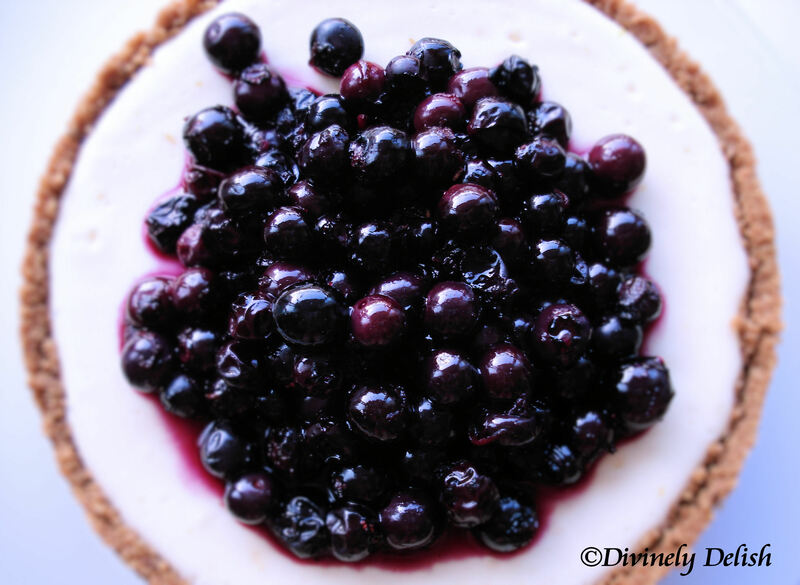 You can use cream cheese for savoury dishes (dips, pastas, casseroles) or for desserts, including cakes, frostings and of course, cheesecakes. Set the cheesecake pan on a large piece of aluminum foil and fold up the sides around it. Place the cake pan in a large roasting pan. Pour boiling water into the roasting pan until the water is about halfway up the sides of the cheesecake pan; the foil will keep the water from seeping into the cheesecake. Bake for 45 minutes. 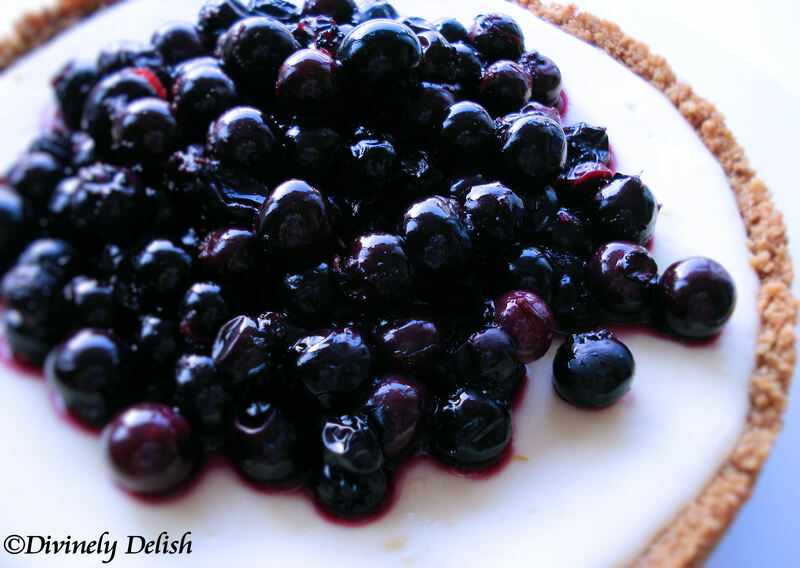 The cheesecake should still jiggle (it will firm up after chilling), so be careful not to overcook. Let cool in pan for 30 minutes. Chill in the refrigerator, loosely covered, for at least 4 hours. 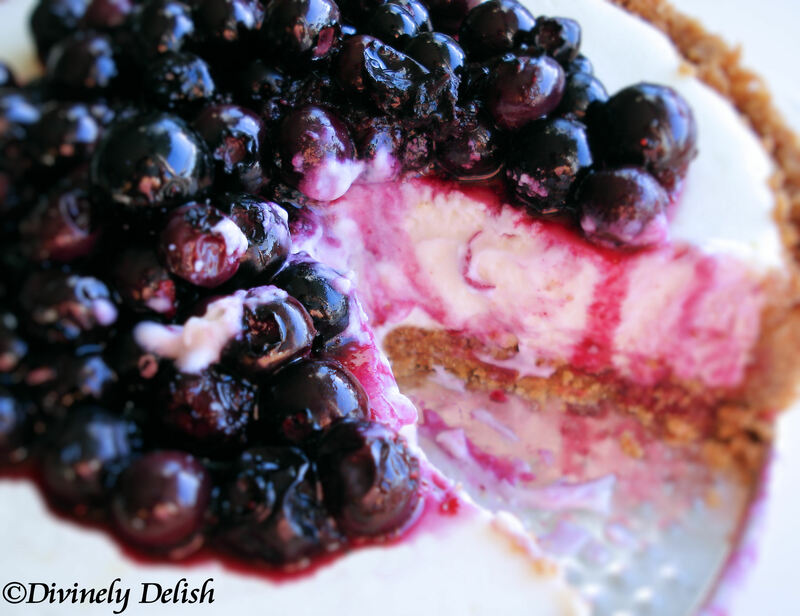 Loosen the cheesecake from the sides of the pan by running a thin metal spatula around the inside rim. Unmold and transfer to a cake plate. Using a spatula spread a layer of Lemon Blueberry topping over the surface.